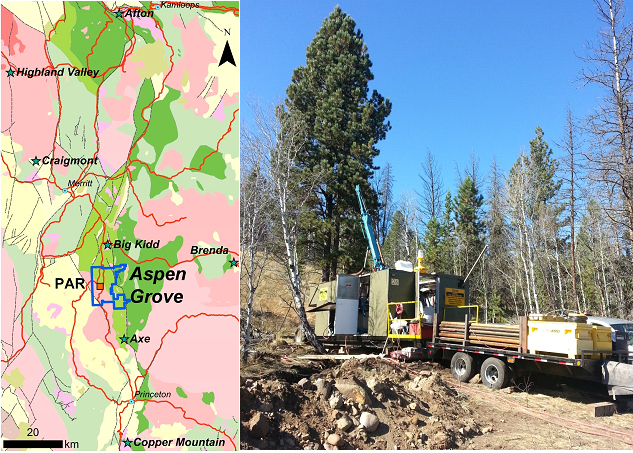 VANCOUVER, CANADA – Kaizen Discovery Inc. (TSXV: KZD) is pleased to announce that drilling at the Par prospect of its Aspen Grove Project has intersected widespread alteration and copper (Cu), zinc (Zn), molybdenum (Mo), silver (Ag) and gold (Au) mineralization. The Par prospect was tested by four diamond drill holes totalling 2,012 metres over a strike length of 880 metres. Drilling highlights include a nine-metre interval in hole AG14-01 assaying 0.241% copper, 0.79% zinc and 6.4 grams per tonne (g/t) silver; and a 16-metre interval in hole AG14-02 assaying 0.313% copper. The induced polarization (IP) and phase one drill programs were the initial step in a two-year, C$4 million campaign funded by ITOCHU Corporation to aggressively explore key targets at the Aspen Grove Project. Aspen Grove is favourably situated in southern B.C. 's premier porphyry belt, 45 kilometres north of the Copper Mountain Mine and 85 kilometres south of the Highland Valley Mine. Kaizen's mineral claims comprising the Aspen Grove Project cover 11,237 hectares. "These results confirm the existence of at least two distinct types of mineralized systems at Aspen Grove and when taken together with recently completed geophysics, yield a series of high priority, future drill targets. Subject to final input from our project partners, we look forward to further exploration in 2015 at Par and other copper prospects at the Aspen Grove Project" said B. Matthew Hornor, Kaizen's President and Chief Executive Officer. Kaizen and ITOCHU are party to a framework agreement that established a collaborative working arrangement under which both companies agreed to evaluate opportunities to explore and develop selected, high-quality, international mineral projects. Aspen Grove is the first such project. Kaizen announced the receipt of C$4 million in project financing from ITOCHU on August 22, 2014, following the execution of a definitive investment agreement, whereby ITOCHU earned a 40% interest in the Aspen Grove Project. All drill holes intersected broad intervals of intense silicification and phyllic (quartz-sericite-pyrite) to advanced argillic (pyrophyllite, dickite, diaspore, kaolinite) alteration in high-level quartz-feldspar porphyry intrusions and related submarine felsic volcanic and volcaniclastic rocks. In addition, drill hole AG14-02 intersected a well mineralized diorite porphyry intrusion underlying a mineralized breccia pipe. Location of Aspen Grove Project in British Columbia (left) and drilling at site (right). The southernmost drill hole, AG14-01, was collared about 100 metres west of Tormont Mines' historical drill hole H-27 (1964), which intersected 0.86% copper and 44 g/t silver over 20 metres (110 to 130 metres). The historical intersection correlates with the interval between 210 and 219 metres in hole AG14-01, where Cu-Zn-Pb-Ag mineralization (up to 0.98% Cu, 2.22% Zn, 0.26% Pb and 15 g/t Ag over one-metre sample lengths) is associated with semi-massive sulfide mineralization associated with intense phyllic alteration. This zinc-enriched semi-massive sulfide zone is the uppermost of five semi-massive to massive sulfide intervals at 210-219, 326-328, 333-338, 341-349 and 362-369 metres. The four massive sulfide intervals between 326 and 369 metres are associated with variable brecciation, intense silicification and advanced argillic (pyrophyllite, dickite, diaspore) alteration. Bedding observed in at least one of the massive sulfide intervals suggests a syngenetic (volcanogenic massive sulfide) origin. These lower intervals are characterized by Cu-Au-Ag mineralization (up to 0.68% Cu, 0.95 g/t Au and 25 g/t Ag) with much lower zinc values; copper sulfides include bornite, covellite, enargite and possible chalcocite. In between the upper zinc-enriched and lower copper-gold enriched massive sulfide intervals is a broad zone of strongly phyllic altered quartz-feldspar porphyry with pyrite and copper- and zinc-sulfide and quartz-sulfide veins and stockworks. Drill hole AG14-02 was collared 190 metres north of AG14-01 and tested the northern margin of a strong magnetic bulls-eye associated with mineralized polymictic intrusive clast breccias interpreted as a breccia pipe. Grab samples of breccia mineralization have returned values of up to 0.38% copper and 0.11 g/t of gold, while samples of mineralized phyllic-altered porphyry have returned up to 0.76% copper and 0.59 g/t of gold (reference: West Cirque Resources news release, October 22, 2013). The breccia, intersected between 25 and 49 metres, contains quartz-feldspar porphyry and microdiorite clasts and is strongly altered (potassic overprinted by sericite-chlorite and phyllic) and variably mineralized with chalcopyrite (42 to 1120 ppm Cu), molybdenite (4 to 72 ppm Mo), magnetite and hematite (after magnetite). Below the breccia (49-89 metres), a microdiorite porphyry intrusion contains abundant magnetite and hematite after magnetite veins cut by later pyrite-chalcopyrite and quartz-pyrite-molybdenite veins. Below the porphyry, a thick sequence of phyllic-altered felsic tuffs and volcaniclastic rocks contains widespread quartz-pyrite-molybdenite veins. Drill holes AG14-03 and AG14-04 were collared 245 and 715 metres north of AG14-02. Both drill holes intersected similar sequences of intensely altered felsic volcanic and volcaniclastic rocks and quartz-feldspar porphyry. Alteration consists mainly of strong silica and phyllic alteration, with narrower intervals of advanced argillic alteration (at 20-65 metres in AG14-03 and 53-69 metres in AG14-04). Sporadic copper, zinc and molybdenum mineralization is present as well as anomalous gold and silver (up to 718 ppm Cu, 7,310 ppm Zn, 236 ppm Mo, 0.065 g/t Au and 4.1 g/t Ag in AG14-03, and up to 685 ppm Cu, 3,560 ppm Zn, 0.105 g/t Au and 4.2 g/t Ag in AG14-04; all values are for individual one metre samples). The Par alteration system is characterized by widespread magnetite destructive phyllic to advanced argillic alteration in a felsic volcanic center which is partly delimited by a 1 by 2.6 kilometre magnetic low in property scale airborne magnetics. Structurally, the system is controlled by the important synvolcanic regional fault (Otter Creek Fault) which separates the Late Triassic central Nicola Group from the Late Triassic Allison Lake pluton; strong ductile deformation fabrics are present locally in both core and outcrops. A Volterra 3-D IP survey completed by S.J. Geophysics during the drill program outlines a significant north trending resistivity low which correlates with the strong phyllic to advanced argillic alteration intersected in AG14-01. The 200 to 400-metre wide resistivity low extends over a strike length of three kilometres and is partly overlapped by a 400 by 800 metre chargeability high. The top of the chargeability high correlates with the porphyry and breccia-style Cu-Au-Mo mineralization in outcrop and in AG14-02; however it plunges to the east away from the west plunging drill hole trace and has not been tested at depth. The mineralization and alteration observed in core at Par is interpreted as a hybrid high-level porphyry - high sulfidation epithermal system with associated volcanogenic massive sulfides (VMS). The association of high sulfidation VMS mineralization with a felsic volcanic center in a submarine volcanic arc environment may be analogous to modern sea floor high sulfidation VMS systems which have been described in the Lau and Manus Basins in the western Pacific Ocean; examples include Nautilus Minerals' Solwara 1 deposit. The alkalic porphyry/breccia type Cu-Au-Mo mineralization intersected in AG14-02 appears to be superimposed on this early synvolcanic mineralization. Kaizen's disclosure of a technical or scientific nature in this news release has been reviewed and approved by John Bradford, M.Sc., P.Geo. and Chief Geologist for Kaizen, who serves as a Qualified Person, as defined under National Instrument 43-101. Mr. Bradford has verified the current technical data regarding the Aspen Grove Project disclosed in this new release. Rock-sample assay results reported previously for Par are from grab and small (about one metre) chip samples that are representative of various outcrop locations varying from unaltered to very strongly mineralized rock. No inference about average grade over a volume of rock can be made on the basis of reconnaissance-scale sampling of this nature. Sample preparation and assaying was carried out at ALS Minerals' North Vancouver analytical laboratory. Samples were analyzed for 35 elements, including copper, by aqua regia digestion and ICP-AES, while gold was analyzed by fire assay (30-gram nominal sample weight), aqua regia digestion and ICP-AES. Over-limit copper (>1%) was re-analyzed by aqua-regia digestion and ICP-AES. Historical assays of Tormont Mines' drill core at Aspen Grove are recorded in typed drill logs with sample numbers, footage intervals and copper, silver and gold assays. Gold assays are recorded with a detection limit of 0.005 ounces per ton. The assays cannot be verified as the laboratory assay sheets are not attached to the logs. Most of the core is still in racks on the property but hole numbers and footages can not be verified. Locations of four drill holes were verified in the field and plot close to locations on maps filed for assessment. Nevertheless the core assays should be considered as historical information only and should not be relied on. Drill-core samples (one-metre sample length) for the Aspen Grove Project were prepared at Kaizen's core logging facility in Merritt, B.C., and samples were shipped to ALS Minerals' preparation lab in Kamloops, B.C. Samples were analyzed at ALS's ISO 9001:2008-certified North Vancouver laboratory for gold by fire assay and ICP-AES, and for 35 elements, including copper, molybdenum and silver, by ICP-AES using an aqua regia digestion. Core intervals cited above represent apparent, not true widths; true widths are not known. Blanks, standards and duplicate samples were inserted into the sample sequence with a ratio of approximately one sample out of 10. The 2014 drilling program and sampling protocol was supervised by Nils Peterson, M.Sc, P.Geo, and by John Bradford, M.Sc., P.Geo. Forward-looking statements may include, without limitation, statements regarding further exploration at Par and other of the copper prospects at the Aspen Grove project, and the identification, exploration and development of high quality mineral projects and the delivery of minerals to Japan's industrial sector.